Not so much a blog, more a footnote to a blog I wrote a week ago about chaos on Thameslink trains. For myself and future historians of bureaucratic incompetence. So last night I went to see Il Puma Londinese’s Italian language Edinburgh Fringe preview at Mama Biashara in London, where I found out that, if a woman is feeling a bit lethargic, one cure is for her to take part of a Viagra tablet, which starts the blood rushing around and perks you (the lady) up. Who knew? 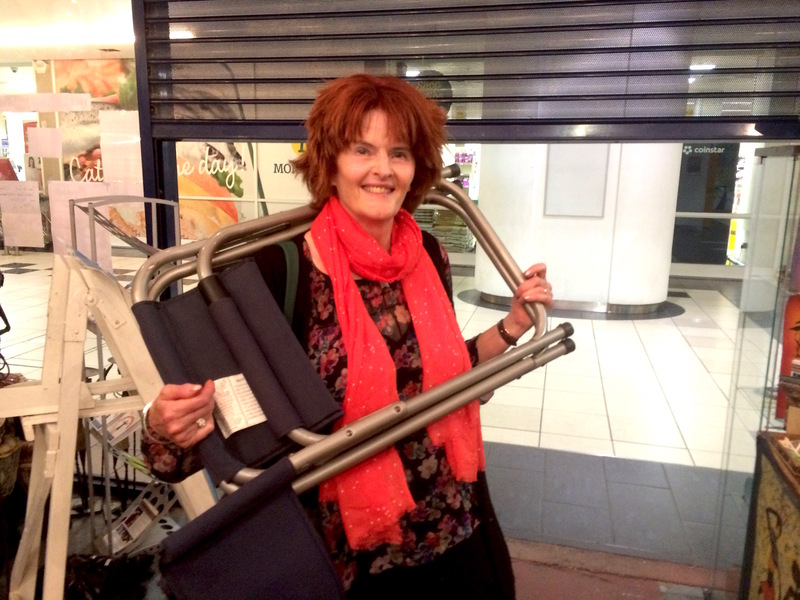 Afterwards, I got a civilised Overground train to West Hampstead where I changed stations. There are three stations at West Hampstead – all called West Hampstead – all in different locations about 2-minutes walk from each other. As usual at night, chaos reigned at West Hampstead’s Thameslink station. As I arrived, just before 2310 and went down the steps to the platform for my 2325 train, people on the crowded platform suddenly started to run en masse up the stairs towards me. Without warning, the train was coming in on another platform. This is normal. 20 seconds later, the train arrived on the other platform. Unusually, as far as I could see, only two passengers did not get over in time and were left stranded when the train left. This is an abnormally low number. I realised it was going to be worth Tweeting, because Thameslink trains are like a man juggling spaghetti blindfold. TWEET: W Hampstead chaos @TLRailUK – 2310 train platform changed at 20 secs notice. Unusually tannoy warning (but on wrong platform) Daily chaos. TWEET: W Hampstead chaos @TLRailUK – Good news. Only 2 people missed train cos platform changed at 20 secs notice. Daily chaos. Normal daily service via Govia’s Thameslink. Trains either cancelled or overcrowded. TWEET: W Hampstead chaos @TLRailUK – 2325 train platform changed at 30 secs notice. No one able to get on 4-carriage train. Daily chaos. Thameslink have what seems to be a policy that fast trains (stopping at fewer stations with fewer passengers) are 8-carriages and slow trains (stopping at more stations with more passengers) are 4-carriages. 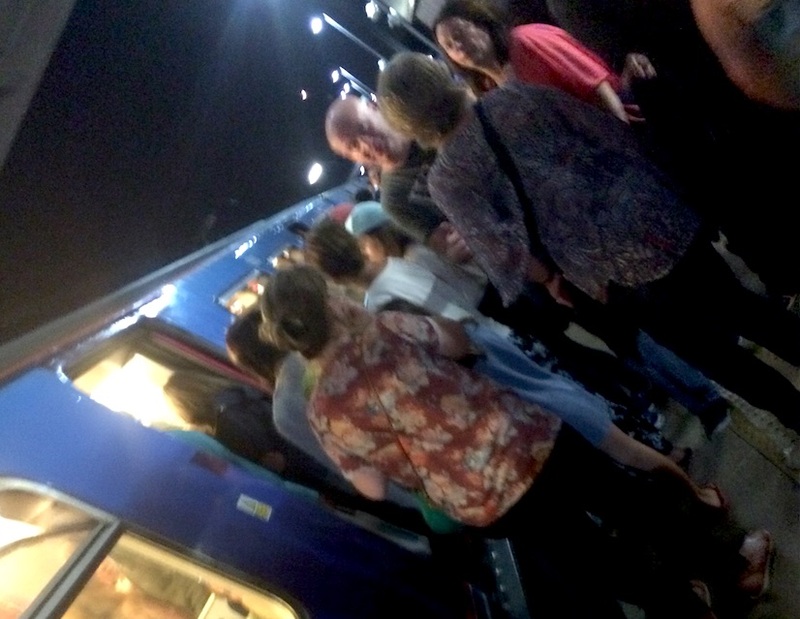 The previous train (8 carriages) had left relatively empty (and leaving two punters stranded). This 4-carriage train I tried to get on was packed to the extent that, when the doors opened, bottoms, arms, bags and heads spilled out. As far as I could see, as about 40-60 would-be passengers like me ran from carriage to carriage, no-one could get on anywhere. The train left, leaving all the would-be 40-60 passengers behind. 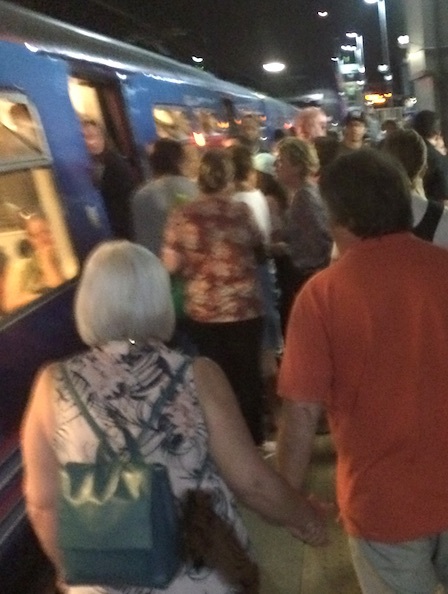 TWEET: W Hampstead chaos @TLRailUK – No room on slow 4-carriage train. Fast 8-carriage train coming. No slow trains known. There was a half-heard tannoy announcement (on the wrong platform) that the next train would be a fast train of 8 carriages. TWEET – W Hampstead chaos @TLRailUK – Passengers still arriving on wrong platform as that’s what signs say. Daily chaos. Hope of any train fading. The indicator board on our platform – the one where trains were leaving from – showed the next (fast) train. The indicator board on the wrong platform, from which trains were probably not leaving, indicated that my next (slow) train, due at 2355, would leave from there. New passengers continued to stream onto that wrong platform. We, the orphans of the previous slow train, stayed on our platform, taking bets our train would come in here. A Dunkirk spirit broke out. People started talking to each other. An attractive Romanian girl with a backpack told me she was amazed at the chaotic railway system in Britain. She told me: “No,” but not with much conviction. The (fast) 8-carriage train came and left, half empty. TWEET: W Hampstead chaos @TLRailUK – 2355 train platform changed at 2354. Although still signed on wrong platform. Daily chaos. Our 4-carriage train, full to overflowing, arrived with passengers still legging it across from the wrong platform. Miraculously, some people got out and some of us squeezed into the train. Most were left behind on the platform. 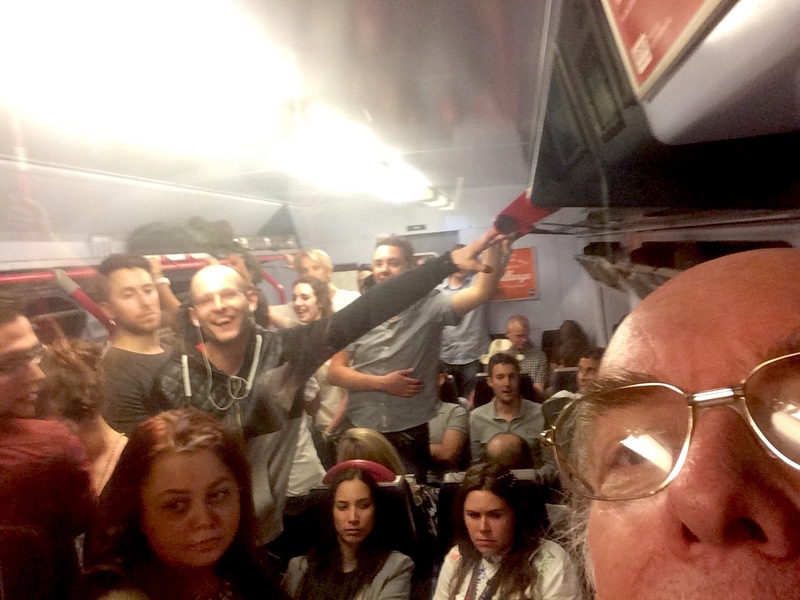 TWEET: Thameslink chaos @TLRailUK – I got on cattle truck train at W Hampstead. Many did not. Daily chaos. Squeezed into my carriage were three small-ish children aged about 8 or 9, coming back from some special day out with their parents. The family had been separated from the other people they had been with because they had been unable to get on a previous train. The children were clinging on to their parents (they did not have much choice) and had scared eyes. Their parents were trying to calm them. 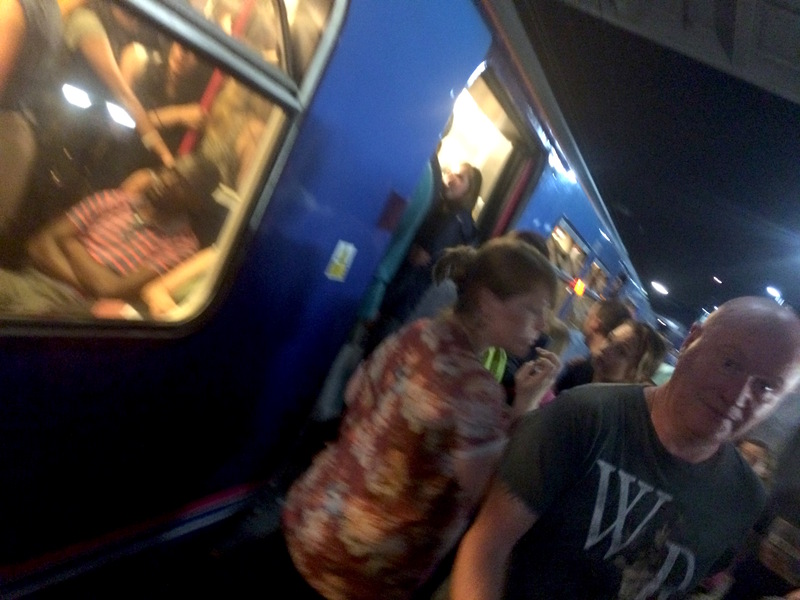 TWEET: Result of 8-carriage fast trains & 4-carriage slow trains on Thameslink @TLRailUK – Daily chaos & scared children. 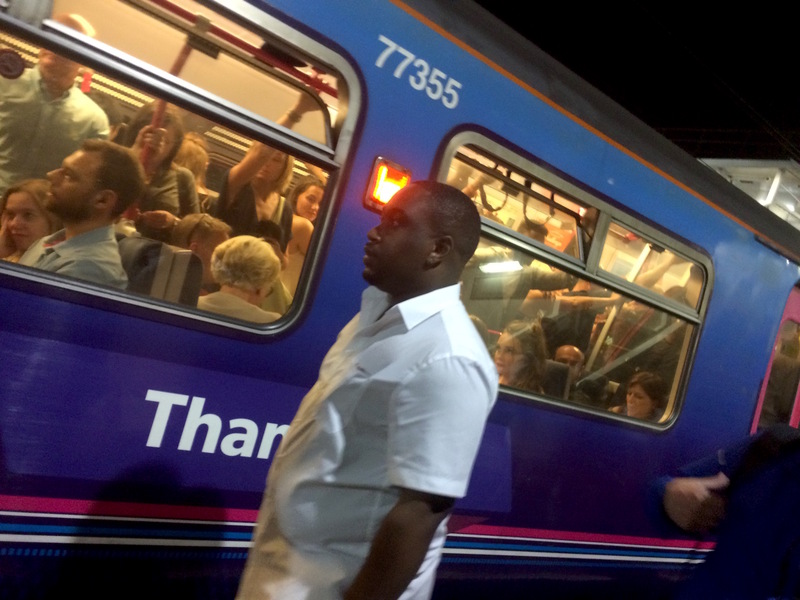 TWEET: Thameslink chaos @TLRailUK – Just took 70 minutes to do a 14 minute journey. Daily chaos. It has been like this since Govia took over the Thameslink rail franchise towards the end of last year. It is now June. I imagine the Govia directors have chauffeur-driven cars. Perhaps Govia should take corporate Viagra.